Nadine Hurwitz is a Qualified Yoga Alliance yoga teacher and has been practicing yoga since 2002. Nadine is the owner of Yoga Lova where she has created a unique environment where students can feel comfortable to practice yoga, at their own unique level. Nadine continues to advance her yoga studies and experience, with a particular focus on the health, integrity and alignment of the human body. She has been privileged to learn from local and international teachers including Faeq Biria; Carrie Owerko; David Jacobs & Jurgen Meusel; Patrick Creelman & Rinat Perlman, Dize Watson and Lars Kruger. “Yoga brings me joy. It is something that stays deep within that I am lucky to access whenever I need it.”. Brendi’s yoga journey began soon after the birth of her children. She was looking for peace and serenity while still challenging herself physically. As a Clinical Social Worker for the past 20 years, Brendi was drawn to the connection between the mind and body that yoga offers. Brendi is a qualified Yoga Alliance Teacher and has been teaching since 2011. She has completed various workshops and trainings, both locally and internationally with David Jacobs, Jurgen Meusel, Patrick Creelman, Rinat Perlman, Seane Corn and at home, with her senior teacher, Nadine Hurwitz. Mel started her practice in 1999 when she discovered that all she needed to do was tie herself into a knot to feel at peace! Mel has over a decade of teaching experience and has created an incredible following for her unique teaching style. Her hands on approach to adjusting and teaching is a way of connecting to body, breath and feeling rather than thinking and analysing. Mel’s teaching often tends to take students to their edge of intensity, giving them the opportunity to play with scary places and even get familiar with a few hidden fears, both physical and emotional. Tanya has been teaching since 2006 and was one of the first Vinyasa trained teachers in South Africa. Tanya is not only committed to the physical practice, but is also deeply aligned with the Spiritual Purpose of Yoga. She loves to see the transformation that Yoga brings to the lives of her students, from fitness and flexibility, to stress-release and deeper soul-shifts and personal awakening.Tanya has always been spiritually intuitive and drawn towards the mystic nature of existence. “I am constantly in awe by the depths of revelation to which this Yogic Path continually takes me and the joy that it brings to my life. Through my teaching, I hope to create this same experience for my students”. Before Yoga, Bruce led a professional corporate life. In 2006 he studied Reiki at the Reiki Master Level and then in 2007 Mindfulness Meditation, and so began his journey into conscious living, eventually leading him to Yoga. First studying Vinyasa Yoga (ERYT200) and then studying Jivamukti Yoga (Certified 300 Hours), under guidance of his yoga teachers, Sharon Gannon and David Life, the founders of Jivamukti Yoga NYC. Bruce compassionately teaches all levels of Yogis: absolute beginners to advanced Yoga practices, preferring to keep his teaching accessible and relevant to a modern world. Lia started her yoga practice many years ago as it was the one space where she felt blissfully alone yet as a body, surrounded by like-minded practitioners and beautiful teachers to look up to. She became a teacher because she wanted to do something that was so much bigger than herself and to give something of what she had learned to others. “Teaching yoga is a little sanctuary I have in my week, to connect and guide students through such a healing tradition. But Yoga isn’t just a health ritual, it’s a movement, and every day I am so awakened by how it changes lives”. 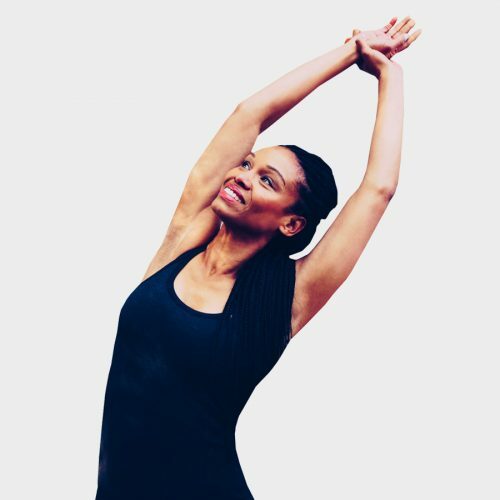 Dize Watson has been practicing Iyengar yoga since she was eighteen. She has been fortunate to learn and study with world-renowned Iyengar teacher Faeq Biria since 1999. During this time, she has attended various workshops, summer intensives, assisted in general classes, pregnancy classes and “therapeutic classes” and also taught classes at Le Centre de Yoga Iyengar de Paris. Dize currently lives in Johannesburg and teaches both group and private classes. She has been dedicated to the practice of yoga for nineteen years and has been teaching for fifteen years. Therese began her yoga journey over 10 years ago. Since then she has been dedicated to the practice, teaching and integration of yoga into her daily lifestyle. Therese's teaching style comes from deep within - a place of integrity, humility, kindness, sensitivity and connection. Both teaching and practice have always been home to Therese. She loves the creative appeal of yoga - where every class is a journey, a very personal one and each one is different from the last. Her teaching style incorporates both a huge respect for the tradition of simple postures combined with the fun of the occasional challenge. Off the mat, Lizzy is a seasoned Change Management executive, with corporate experience as a consultant. She lives in Johannesburg with her husband and three children. Thanks to her mother, Tegan Burger has been fortunate enough to have had yoga in her life from a very young age. Tegan has been teaching since 2012. During this time she has advanced her training and teaching. To complement her yoga journey, Tegan is currently studying a BSc in Nutritional Science.